"Snowflakes are like kisses sent down from heaven." This giveaway includes gifts to help you be a little kinder to yourself and add some sweetness to your life! How to Enter: Tell somebody about the contest. Then send me your name in an e-mail. 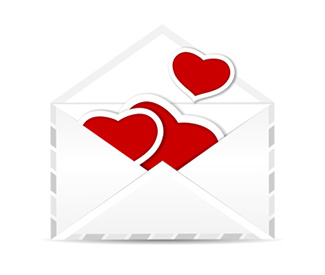 Newsletter subscribers can forward the current newsletter. Visit my Facebook Writer page and share the post about the contest. Box contains: Dare to Be Uniquely You 14 oz. 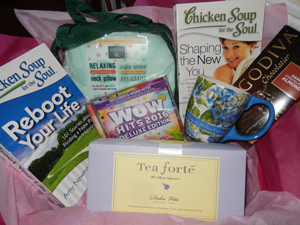 Mug, Chicken Soup for the Soul Reboot Your Life, Earth Therapeutics microwaveable Comfort Wrap, Chicken Soup for the Soul Shaping the New You, Wow Hits 2016 Deluxe ed. CD, Tea Forté Dolce Vita (dessert teas assortment), and a Godiva Dark Chocolate Almond bar! Looking out my kitchen window the other day I thought what is that bush doing sprouting buds in this frigid weather? Then I remembered a couple years ago we'd planted a witch hazel in a corner of our backyard. When most plants lay dormant, vibrant yellow flowers coat the witch hazel's otherwise bare branches. The frilly blossoms brighten the gray days of winter, reminding me spring is on the way. "Just think, you're not here by chance, but by God's choosing you. His hand formed you. He made you the person you are. On cold winter days our family always enjoyed this scrumptious all in one meal. Stir flour with salt, cut in butter, add water, and mix to form dough. Divide into eight equal-sized balls. In a large skillet scramble sausage until lightly browned. Drain off any fat. (Our local grocer makes their own sausage so lean there is usual no fat to drain.) Add onion, grated carrots, and chopped cabbage. Cook until onions start to caramelize. Heat oven to 425°. Line a baking sheet with parchment paper for easy clean up. Roll each ball of dough into about a 7" round; lay on baking sheet, and spoon filling down the center. 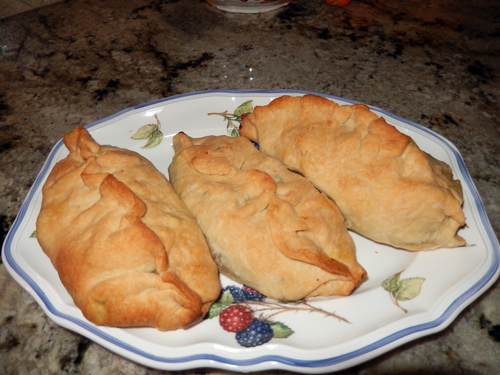 Pull two sides of dough to the center and pinch together to seal in the filling. Bake at 425° for 10 minutes, reduce temperature to 350° and bake 40 to 45 minutes until golden brown. Enjoy! You can easily freeze these for a quick dinner when you don't have time to cook. Jan - I am an Oregon farm wife, we are mostly retired now, and only put up hay, but still live on our little farm. I have decided to learn to make quilts in my old age. Always wanted too but life got in the way, so now is my time. Janet - I have a letter that my dad wrote to my grandparents when he & mother were stationed in Germany after WWII. Daddy had told mother not to tell her parents they were expecting (me) & they would surprise them later with the news. So...mother didn't write to her mom & dad, but....my daddy did write them two days after he told her not to. She wasn't mad & he was happy! That letter is very special to me! Andrea - A "wonderfully unique thing about me"? I am a kind person. I try to support everyone where they are, not where everyone thinks they should be, whether it be a listening ear or a hug. Wendy - I am involved with a local senior center. In our crocheting & knitting group, I have donated hats, scarves, prayer shawls, and baby blankets. The things we make go to people who need them. They go to hospitals, Meals on Wheels, nursing homes, veterans' hospitals, and anywhere we can find anyone who needs the items. I feel so fortunate for having my health and a place to live. I love helping others where I can. Rita - I don't think I'm special in any way, but I always have people tell me that I have a gift of encouraging, giving, and always helping. I've been a nurse for 40+ years & get great joy in taking care of people, especially seniors who are often forgotten. 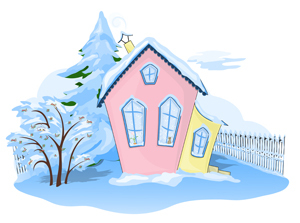 Donna - My favorite things to do are fishing, quilting, sewing baby items, and reading. I read every day, sew and/or quilt almost every day, and go fishing at least once a week with my husband and/or my 73 year-old dad. Kathy - I'm loyal to my friends. Cindy - I enjoy doing cross stitch. So when someone has a birthday, I find out what their favorite Bible verse is and make a book marker or a wall hanging with their verse and decorate it with flowers and/or a border. Then I can frame it for a one of a kind birthday gift. The Greatest Love letter ever written - God's Word! Did you know God knows everything about you? Psalm 139:1-4 says, "Oh Lord, you have searched me and you know me. You know when I sit down and when I rise; you perceive my thoughts from afar. You discern my going out and my lying down; you are familiar with all my ways. Before a word is on my tongue you know it completely, O Lord." Besides the good deed we did, He knows the harsh word we spoke, the argument we had with our spouse, that jealous or impure thought we had, that bit of gossip we revealed, and yet he loves us completely. Dozens of verses speak of God's love for us. He loves us so much that Jesus spread out his arms, suffered and died for you and for me. With those same arms he waits to embrace us with great love. And there's no better time than the start of a new year to determine to walk in His complete and perfect love for you than in 2016!